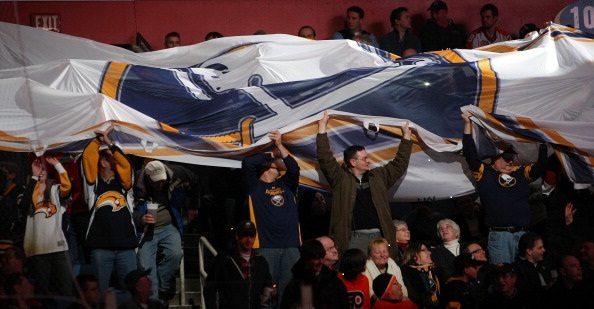 Why So Serious, Sabres Fans? Sabres fans who are disgusted and angry about whats happened thus far in the 2013-14 season need to take a deep breath, and relax. Did you really think that Buffalo was gonna come out of the gates blazing hot with three teenagers on the 23 man roster? Did you even look at the first 15 games on the schedule? Darcy told you last season what was going to happen. He said, “It may require some suffering,” in his season ending press conference. The “it” he’s talking about is obviously the rebuilding process the Sabres have started this year. So far the long tenured GM is right. Buffalo is 0-5-1 in their first six games this year, and have looked just “OK” in two of those games (Tampa Bay, Chicago). Let’s face it. The Sabres will finish in the cellar after their 82nd game is finished this season, and everyone will be angry at the world. The young talent (Grigorenko, Ristolainen, Girgensons, Zadorov, Foligno, Armia, Larsson) will gain experience from the time that they’ll see this season, whether it be in Buffalo or Rochester. Thomas Vanek will be looked at by almost every team in the league around the trade deadline, and he will absolutely be moved. Goaltenders are the toughest players to move during the deadline, but, the way Ryan Miller has played this season could very well change that. Even if you move just one of those players, you’re adding more potential to a team that already has nothing but upside. It isn’t exactly difficult to turn things around quickly in the NHL. The parody couldn’t be any better if you’re a hockey fan. Sure, you have your perennial power houses, but sometimes a team is just one or two pieces away from from being very competitive. The Avalanche grabbed the first overall pick, changed coaches, and now sit atop the Western Conference along with the San Jose Sharks (a perennial playoff team). Things can change quickly, and finishing last at the end of this season could very well change things completely.